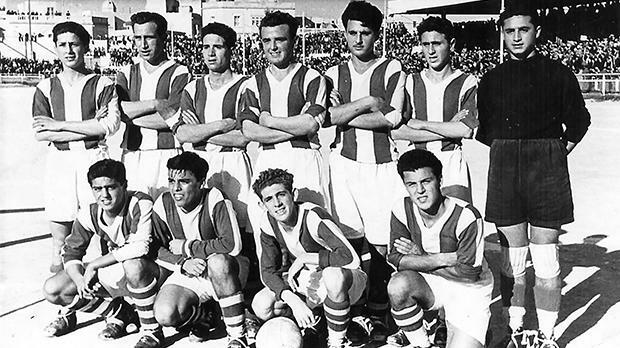 A typical Floriana FC formation in season 1950-51. (Back row, left to right) Victor Farrugia, Leli Zammit, Joseph Grech, Lolly Debattista, Tony Dalli, Lolly Borg, Frankie Busuttil. (Front) Charlie Azzopardi, Tony Vella, Pullu Demanuele, Benny Camilleri. In 1950-51 the main protagonists in the Maltese football league were Floriana and Hibernians. The Paolites opened their championship campaign on October 14 with a 2-0 victory over Sliema Wanderers. Hibs’ superior speed, stamina and determination gave them a deserved victory over their bogey team. As anticipated, Floriana, champions the season before, easily disposed of the weak challenge put up by St Patrick. The Greens ambled through to an easy 7-0 victory before sharing the spoils of a 0-0 draw with rivals Valletta. Hibs continued their good start to the season with an easy 2-0 victory over Luqa St Andrew’s. However, in their next game against Floriana, a gift goal gave the Greens the impetus they needed to break the Paolites’ stubborn resistance. A seemingly harmless cross-pass which Johnnie Formosa seemed to have well covered hit full-back Victor Portelli and ended in the net. This freak goal took the fight out of Hibernians and the Greens went on to win the game comfortably 3-1. Hibs recovered quickly from this setback and in their next match they defeated Valletta. A brilliant display of goalkeeping by Luqa St Andrew’s goalkeeper Buttigieg and a generous slice of good luck gave the underdogs an unexpected 0-0 draw against Floriana. For Luqa this was the only bright spot in a dull season. The vital match between Sliema Wanderers and Floriana was one of the unluckiest in the history of the Blues. In the first period, play was evenly divided. Then, at the start of the second half, Floriana opened the score. Sliema pressed hard for the equaliser but luck was not with them and the desired break never came their way. Seconds from the final whistle they should have scored but Tony Nicholl saw his shot hit the upright and rebound back into play. Hibs re-joined Floriana at the top of the table with a 5-0 victory over St Patrick’s but they did not enjoy their exulted position for long because the next weekend Floriana regained the leadership with a fine 5-1 victory over St George’s. Floriana were by now leaving their rivals behind them. Only Hibernians persisted in the chase. Once again, however, the Paolites’ Dr Jekyll and Mr Hyde complex let them down. In their very next match they lost miserably to Ħamrun Spartans (4-0). Then, true to character, they beat St George’s 1-0 in one of the best matches of the season. Floriana started the second round with a 2-1 victory over the Spartans but Hibernians could only manage a 1-1 draw against Sliema Wanderers. Four minutes from the end the Paolites were leading 1-0 when Nicholl sent a through-pass to the unmarked Maurice Walsh. Victor Formosa panicked and used his hand to stop the pass from reaching the centre-forward. The referee awarded a free-kick right on the edge of the penalty area. Up came Gejtu Sacco who took the kick on the half-turn and gave Sliema a dramatic equaliser. The next day Floriana profited from Hibs’ bad luck when they beat St Patrick 4-1 to increase their lead at the top to three points. On February 17, 1951 Floriana met Valletta. Matches between the two neighbours were always hot affairs but in the Fifties things took a turn to the worse. Violence at the stadium was rife and hardly a match went by without trouble. Everything went well until Floriana took a 2-0 lead. Then, trouble started. The Valletta supporters could take no more and for no valid reason they rained stones on the referee and the linesman. Mr Barbara refused to come out of his dressing-room for the second half but somehow the game was continued with Mr Lusted as the new referee. Valletta reduced the score but their hearts were not in it and they never looked like saving the game. The match between Floriana and Hibernians was played on February 24. It was expected to be a close, hard-fought game but the clash never reached expectations. Hibs did the bulk of the attacking but the Greens’ defence, with Tony Dalli and Lolly Debattista in fine form, controlled the situation perfectly. The match ended goalless leaving the way clear for Floriana to coast through to the league title. The Greens seemed to be well on course when they beat Luqa 5-1 but in their next match they were surprisingly beaten 4-1 by Sliema. With Hibs cruising past St Patrick that same weekend, the championship race was once again thrown wide open. On March 18, Hibs put pressure on their rivals with a 1-0 victory over the Spartans. Everything now depended on the last weekend of the competition when Hibs were due to meet St George’s and Floriana draw swords with Ħamrun. A goal by Oscar Bartolo six minutes from time dashed all hopes Hibs had of winning the championship for the first time in their history. The score was 1-1 and the Saints were fighting a seemingly hopeless rear-guard battle when Bartolo scored his dramatic winning goal. With this unexpected result, the second match of the afternoon lost much of its interest. Floriana celebrated another championship success with a 1-0 victory over the Spartans.